1) There is not another Prophet who carried his mission to decisive victory in all aspects of life. When the Prophet Moses, upon him be peace, who resembles God’s Messenger more than the other Prophets in many aspects of his mission, died, his people were still in the desert, not yet able to conquer ‘Palestine’ after several decades of his preaching. Jesus’ mission was mainly aimed at infusing a spiritual and moral revival into the life of the Jews who had drowned in the bog of materialism. After his elevation to heaven, his disciples succeeded in conveying his message as far as the centre of the Roman Empire despite severe persecutions but, unfortunately, at the cost of the degeneration or corruption of his original creed. 2) The aim of God’s Messenger was never to build a worldly kingdom; he was sent to guide humanity to salvation in both worlds, physical and spiritual; he aimed at reviving people, not killing them. It is to this end that he was obliged to arrange military expeditions and sometimes to command armies. He sent out many expeditions and himself commanded forces 28 times. Fighting took place in almost half of all the military campaigns he organized during his mission, which number about 80, and only around 1,000 people lost their lives in all on both sides. Around 250 Muslims were martyred and 750 non-Muslims were killed. This means that God’s Messenger, upon him be peace, established his Message and brought absolute security to the whole of the Arabian peninsula for the first time in its history, and opened the way to global security, at the cost of only 1,000 lives. This is, as so many of his achievements are, unequalled in world history. 5) God’s Messenger founded a military intelligence service and succeeded in getting all the necessary information about the enemy, but he never allowed any news about his movements to leak out to the opposite side. Before setting out to conquer Makka, Khatib ibn Abi Balta‘a secretly sent a letter with a woman to his relatives in Makka about the preparations of God’s Messenger. However, the Prophet was informed of this, and sent ‘Ali and Zubayr to catch up with the woman and intercept the letter, which they did. Also, God’s Messenger, upon him be peace and blessings, kept secret his military preparations and did not reveal to his Companions where he would march. He tended to take a different direction from that of his real destination and only after some while did he turn to his target. He made much use of tactics securing victory such as speed, surprise attack and flexibility of movement. In most of his campaigns, major or minor, he caught the enemy unprepared and overcame them relatively easily. For example, in the Battle of Khaybar, the Jews got news of his coming upon them only through their farmers going to their fields and so had time only to shelter in their citadels. In the same way, the Quraysh were left nothing to do other than surrender during the conquest of Makka. I start with the name of God,Apart from Whom there is no other god,And Muhammed is the Messenger of God.O unbelievers, and sons of unbelievers, clear out of his way. 7) God’s Messenger was unequalled in introducing new strategies and disuniting the allied enemy tribes. During the Battle of the Trench, the Jewish tribe of Banu Qurayza broke their treaty with the Muslims at a most critical moment of the battle and joined the Quraysh, besieging Madina. Left between two hostile camps, God’s Messenger offered a peace treaty to Banu Ghatafan, who were in alliance with the Quraysh in the war. This discouraged Banu Ghatafan from continuing the war. He also succeeded, with a skilful manoeuvre, in bringing about a disagreement and mutual mistrust between the Quraysh and Banu Qurayza. Also, during the campaign of Khaybar, he first gave the impression that he was marching upon Banu Ghatafan, who were than allied with the Jews of Khaybar. This caused Banu Ghatafan to remain inactive during the campaign, unable to help the Jews. 8) God’s Messenger did what he had to do at each step of his life, and never showed any hesitation or irresolution in executing his plans or intentions. Also, he never retreated during any fighting, nor did he faint and lose heart. He stood steadfast, without moving an inch backward, during the critical moments of both the Battle of Uhud and Hunayn. He called to those of his Companions scattering from around him; Do not scatter! I am Muhammed, the Messenger of God. That is no lie! All the Jewish tribes in and around Madina broke their agreements with God’s Messenger one after the other. When they did not heed his call to them to remain faithful to their agreement, God’s Messenger, upon him be peace and blessings, showed no hesitation in marching upon them – as against the Banu Qurayza after the Battle of the Trench, without taking off his coat of mail; or against the Quraysh army one day after the set-back at the Battle of Uhud – such incidents are very significant in showing his resolution and invincibility. 9) Almost in all of his campaigns, major or minor, God’s Messenger always kept in hand the initiative to attack and direct the war. Even in set battles, like those of Badr, Uhud and the Trench, in which he was made the target of the attack, he did not lose the initiative and, by surprise strategies and effective tactics, he was able to defeat the enemy. He also succeeded in using time and any opportunities that arose in his favour. 10) God’s Messenger, upon him be peace and blessings, usually changed the tactics and strategies he used in battles. For example, in the Battle of Badr, he made an over-all attack upon the enemy after demoralizing them in single combats. In the first stage of the Battle of Uhud, he kept the enemy cavalry inactive through the archers he stationed in the mountain-pass of Aynayn and, hurling his eminent warriors such as Hamza, ‘Ali, Abu Dujana and Zubayr, upon the enemy, he won the victory. As for the Battle of Trench, he faced the enemy with a long, deep trench they dug round Madina and, remaining within the confines of the city, forced the enemy to retreat after four weeks of siege. 11) The Messenger was never short of necessary reinforcement and always kept his lines of communication active. Equally, he never suffered from insufficient logistics. 1. Continuous bodily training. He usually urged his Companions to train themselves in archery, wrestling, swimming and riding horses. He sometimes arranged competitions and even running races, in which he himself occasionally participated. Also, he attached great importance to preserving one’s health and maintaining strength. 2. Good morals and being well-mannered. 3. Devotion to God with unshakable belief, submission and reliance, and obedience to God, to himself and others in authority. The Muslim army conveyed peace and security to the lands it conquered. 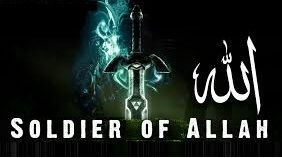 Each soldier of that army was absolutely dedicated to the cause of Islam. The only criterion for them to judge between people was belief in God. They did not feel true love for anybody who opposed God and His Messenger, even if they were their fathers, children or brothers (See, al-Mujadila, 58.22). Because of this, it sometimes happened that children and fathers or brothers met in opposing armies on the battlefield. Thank you, father! You have given me three minutes to communicate to you my religion.
. Andrew Miller, Church History, 285; Bukhari, Manaqib, 9.
. Bukhari, Tayammum, 1, Salat, 56.
. Nasa’i, Sunan, 5.212; I. Hisham, 4.13; I. Sa‘d,2.121.